Background: Hit identification is the starting point of small-molecule drug discovery and is therefore very important to the pharmaceutical industry. One of the most important approaches to identify a new hit is to screen a compound library using an in vitro assay. High-throughput screening has made great contributions to drug discovery since the 1990s but requires expensive equipment and facilities, and its success depends on the size of the compound library. Recent progress in the development of compound libraries has provided more efficient ways to identify new hits for novel drug targets, thereby helping to promote the development of the pharmaceutical industry, especially for firstin- class drugs. Methods: A multistage and systematic research of articles published between 1986 and 2017 has been performed, which was organized into 5 sections and discussed in detail. Results: In this review, the sources and classification of compound libraries are summarized. 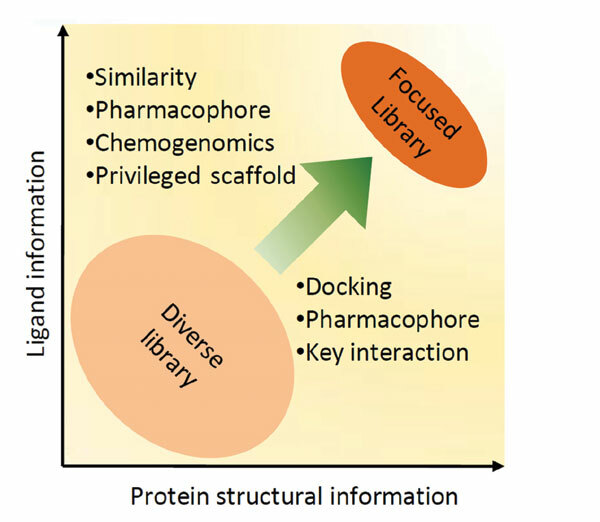 The progress made in combinatorial libraries and DNA-encoded libraries is reviewed. Library design methods, especially for focused libraries, are introduced in detail. In the final part, the status of the compound libraries at WuXi is reported. Conclusion: The progress related to compound libraries, especially drug template libraries, DELs, and focused libraries, will help to identify better hits for novel drug targets and promote the development of the pharmaceutical industry. Moreover, these libraries can facilitate hit identification, which benefits most research organizations, including academics and small companies. Keywords: Focused library, combinatorial library, DNA-encoded library, library design, druglikeness, high-throughput screening, selection-based screening, hit identification. Keywords:Focused library, combinatorial library, DNA-encoded library, library design, druglikeness, high-throughput screening, selection-based screening, hit identification. Abstract:Background: Hit identification is the starting point of small-molecule drug discovery and is therefore very important to the pharmaceutical industry. One of the most important approaches to identify a new hit is to screen a compound library using an in vitro assay. High-throughput screening has made great contributions to drug discovery since the 1990s but requires expensive equipment and facilities, and its success depends on the size of the compound library. Recent progress in the development of compound libraries has provided more efficient ways to identify new hits for novel drug targets, thereby helping to promote the development of the pharmaceutical industry, especially for firstin- class drugs.